Alumni David Meaney has been awarded a French Government Medal and an NUI Prize for Distinction in Collaborative French-Irish Degree programmes 2018. 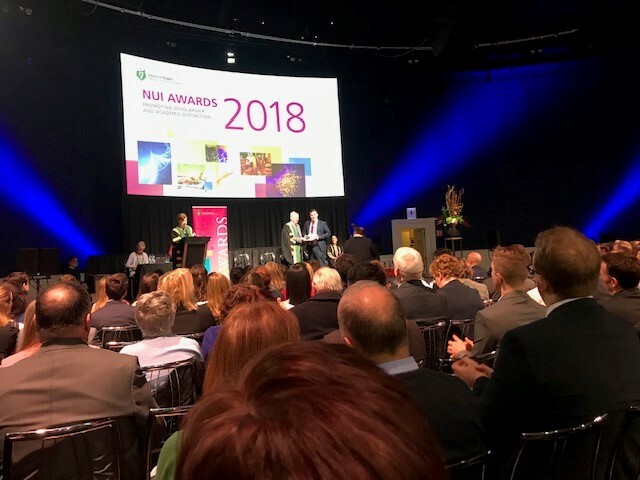 These awards were introduced by the National University of Ireland, working with the French Embassy in Ireland, to highlight programmes which have been established between the NUI constituent universities in cooperation with universities in France. The award ceremony took place in the Mansion House in Dublin on 13 November, 2018. The medal and prize is awarded to a student who has particularly distinguished themselves on French-Irish collaborative programmes. David was today awarded a French Government Medal and an NUI Prize of €1,000. The MSc in Innovation in European Business is designed to meet the needs of international industry by training graduates to understand the drivers of innovation and change in today’s digitally transforming organisations. Running over a 15-month period, including a 5 month placement in a European business, this taught takes place across three campuses in Ireland (UCC Cork), France (ISC Paris) and the Netherlands (HU Utrecht). Our French partner is the AACSB accredited ISC Paris Business School. David Meaney joined the programme in September 2017, and from the outset took on a natural leadership role in the class, being elected class rep and willingly engaging with fellow students and faculty in an open and positive fashion. This programme has a cross cultural vocation, with students from France, Ireland, Holland, India and China making up the 2017 cohort. David’s role in sowing the seeds of collaboration within the class and also with external industry partners was outstanding, and a few examples might illustrate the reason why we feel this exceptional student deserves the recognition of this French Government Medal and NUI prize for distinction. David’s first action was to set up a LinkedIn profile for the programme, which immediately attracted connections from alumni, current students, industry contacts and faculty. This gave him a platform to publicise student achievements (cultural immersion activities, class visit to Citibank and Qualtrics in Dublin in October 2017, site visits to EU institutions in Bruxelles in February 2018, …). In doing so, he encouraged his classmates to use this platform to reach out to industry contacts in their research for suitable placement opportunities. With a class colleague he investigated the creation of an online student experience journal, leveraging the UCC library video resources for content creation. Following a visit to the class by Zartis (Cork based recruitment start-up owned by John Dennehy), David put together a team of students who analysed 800 LinkedIn profiles for software engineers, creating an Excel template to aggregate data on their average employment durations in Ireland, and delivering a report comparing length of tenure for developers from the EU, from Ireland and non-EU countries. This report was published online by Zartis. With his natural friendliness and openness, David has been an excellent ambassador for the programme, and has always been willing to share his experiences with incoming candidates for the programme. On arriving in Utrecht for his final semester in September 2018, David’s first action, unprompted, was to reach out to the new incoming class of 2018, inviting them to connect to the LinkedIn profile, and offering them advice and support in terms of settling in to Cork. The programme directors Monica Riviere (ISC Paris), Jelly Offereins (HU University of Applied Sciences, Utrecht) and Fergal Carton (Cork University Business School, UCC) congratulate David for this medal and prize, this recognition is well deserved, he embodies the spirit of a young European innovator, tackling academic, cultural and professional challenges with a natural positivity that is exemplary.